Hello darlings! How's your summer going? I've been taking some time to enjoy beach days, fresh summer fruits and lots of ice-cream. Summer is my favorite season in the US and that's not too surprising since I grew up in Guyana. Guyana is located in South America and is the only country in the region with English as it's first language. Our culture is very much Caribbean even though we're located in this region. Today's Style & The Bar Cart post is dedicated to my home country! I decided to capture the tropical essence of Guyana and our love to entertain and have a good time. A good Guyanese party is filled with plenty delicious food, nuff rum and music to mek you wine to de ground. Style & The Bar Cart is a creative production that combines my passion for style, decor, vintage and DIY. It serves as outfit and occasion inspiration for the modern girl who loves to entertain and prefers cocktails over wine. Check out my previous entries in the series here and here. As with my previous bar carts, I really like to use items I have on hand and utilize them in different ways. I used a crystal glass as a vase for my faux tropical leaves, stacked books under a plate as a pedestal and also layered my dessert pedestals for added height to display fresh fruit. I purchased the banana leaf printed round tray from H&M home back in February along with the matching coasters. I normally keep this tray in my creative studio/dressing room and use it as a catchall for jewelry. I don't think the tray is available any longer but follow me on Instagram and SnapChat if you want to see when I spot items right away! The faux leaves were used as decor for my bestie's Vintage circus baby shower back in 2012 and you can find those at Michaels Craft store. I also decorated with fresh mangoes and guineps. Have you ever tried guineps? I grew up eating this back home and Grand-dad's tree was the best. Those guineps would melt in your mouth! Grand-dad is not my grandfather, he was a family friend and we called him that out of respect. If you're in NYC, latin markets and the sidewalk fruit vendors usually have this fruit. Let's continue talking about the most important part of this Guyanese bar cart; the snacks and drinks! I wanted to do a combination of sweet and savory eats. My sister sent treats directly from Guyana to me with our friends (thanks Christine & Dominic!) and I'm so excited to share them with you and by share I mean show you pictures, lol! All the snacks for meeeee!!!!! In the dish I have cassava chips, plantain chips and chicken foot. No chicken foot is not what you're thinking, although we eat those too! It's a crunchy snack that's fried from a curry flavored dough. I found a recipe here, in case you want to make these yourself. We usually eat all three of these with mango sour but I didn't have any (insert sad face). Mom made fish cakes for me and those wouldn't be complete without some pepper sauce. We like it hot in Guyana! 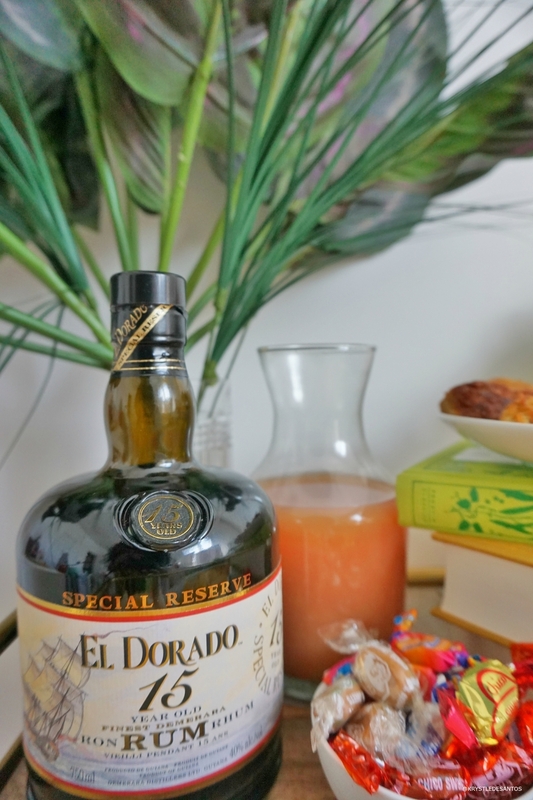 Now let's turn our attention to the star of the bar cart, El Dorado 15 year old rum! We're serious about our rum and this one is often enjoyed on the rocks. I was in the mood for some rum punch so I added a shot to my fruit punch and soon after began dancing to calypso and soca! Banko wine, cherry brandy and D'Aguiar's cream liqueur were also staples on my cart. A crystal decanter holds more rum and I added a bottle of Malibu to the mix. Malibu is not Guyanese but I wanted a white rum option and I like this coconut flavored one. Let's also take a moment to admire this beautiful vintage copper ice-bucket with gold lion knobs! I linked to the exact vintage version in the widget, so you can get one as well! Jaguars are found in Guyana and I thought my famed photo fit nicely into the decor of the cart. The golden pineapple dish was also a great find at H&M home and I added Mithai and tamarind balls for a sweet and sour treat! This vintage dress was made for this Guyanese girl! I almost laid out on the floor when I spotted it, no joke! Look at the beautiful Macaws perched on the Mango tree and the off the shoulder ruffle. This dress also has a pocket that I show off further down in the post. Could anything in life give you more life than this vintage number? I think not! It exudes all the tropical vibes and I styled it with my DIY rope tassel belt, handmade tassels earrings by yours truly, wicker clutch, parrot hinge bracelet and tropical print wedges. I've actually had these heels for about 4 years and this was my first time wearing them. Outrageous, I know! Close up shot of the natural tassel earrings handmade by moi! This is the pocket I mentioned earlier. Swoon! Pockets are a unique characteristic of vintage dresses and I'm not sure why they don't make all modern dresses with pockets! Eat, drink, dance and be merry. Happy Friday! CHECK OUT PREVIOUS ENTRIES FROM THE STYLE & THE BAR CART SERIES BELOW!